I've been kiting for around 4 - 5 years, predominantly on a strapless surfboard. I started foiling in 2016 on a blue Zeeko alloy and probably go to the stage where I could go in a straight line on the foil for about 200m+. I got a bit bored of it, so I ended up selling it and giving up on foiling. I got back into foiling when I found a VERY cheap Mako V1 with a KFA board that was a bit damaged (Christmas 2017). 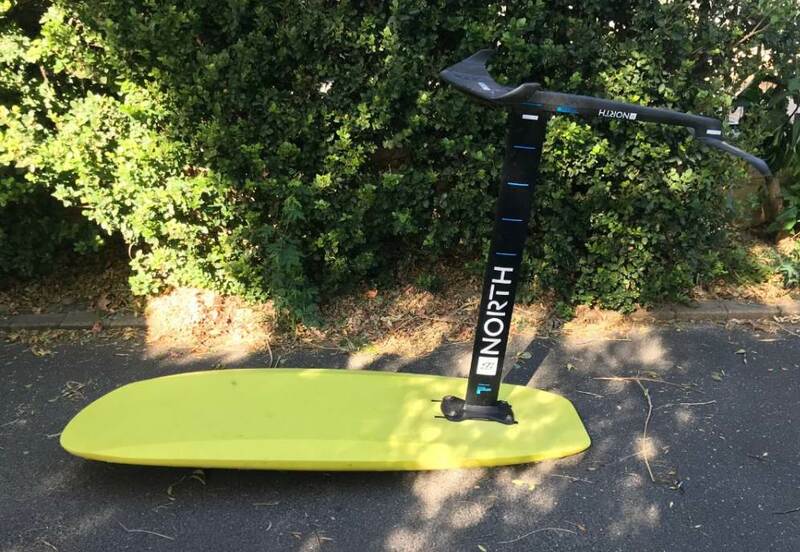 I ended up repairing it and rode it for probably 1-2 hours until the wing fell off into the ocean, that was enough to get me hooked and I ended up buying the North Speedster. I've been riding it now since the start of the year. Unlike the name suggest the Speedster feels very slow (compared to the Zeeko and the Mako). However, after pushing it really hard I was able to get close to 20 knots, a more experienced rider maybe able to push a little more speed out of it. It still felt slow though and I also tested how slow you could go before coming off the foil and it was around 5ish knots. The Speedster has a very smooth and stable ride, this helped a lot when I was learning as I always felt in control. It never picked up uncontrollable speed and the foil feels kind of like a surfboard in the sense you can really dig in to make tight turns or have big drawn out toe side turns. The two most annoying things about the foil are the rear wing and the front foot pressure required. 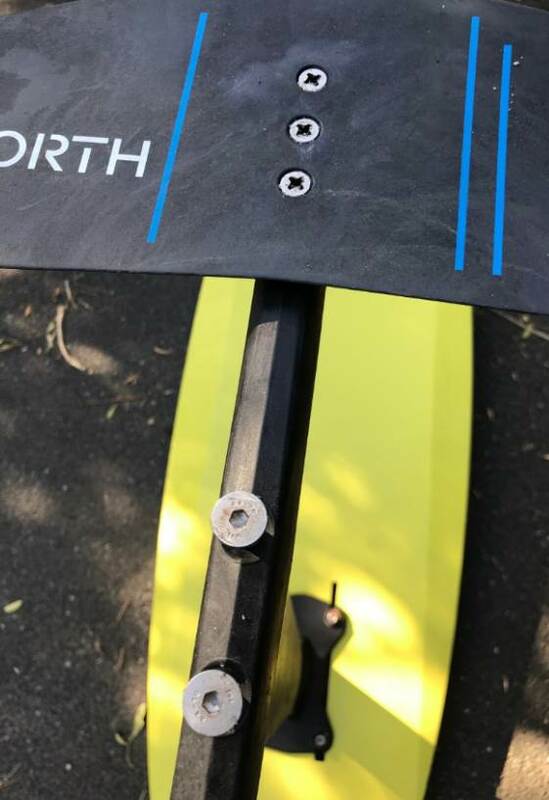 The rear wing is a bit higher then the front wing and I've found when turning hard this can sometimes pop out of the water, it still doesn't affect the stability of the foil as I can still power through the turn. The other annoying thing about the foil is the front foot pressure, I've found it requires a lot of pressure to keep it going and as a result my foot starts to hurt after an hour or two. I've tried it with the wedge under the rear wing and didn't notice any difference, there's also a slight whistle on the foil. 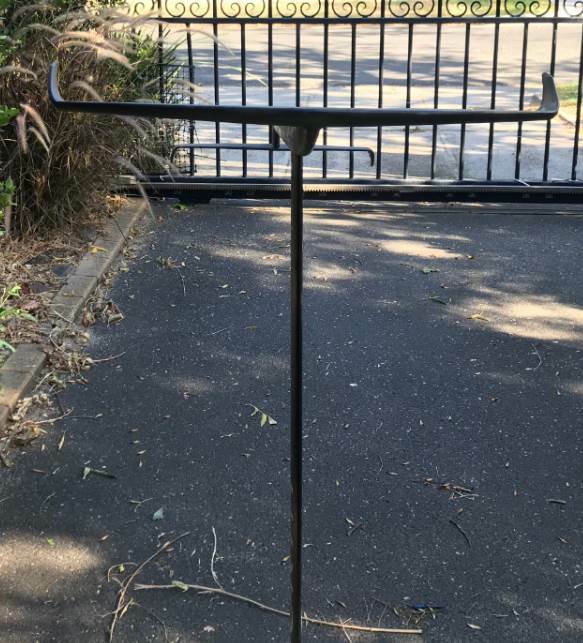 The front foot pressure could be a result of my setup though as suggested in other posts (it is back as far as it can go on the rails). The reason I gave it a 7/10 for the build quality is because of a few reasons. One being the screws to screw in the wings were really tight and F@@king annoying to screw in. Also, why use a Philips head for the wing screws and Allen keys for the middle bolts? Why not have them all the same so I don't have to carry two sets of tools around. The second reason is that the "Composite Carbon" just feels like black hard plastic and you can see where they've sanded it down in some places, it still feels sturdy though and that's probably why it's cheaper and lighter than others. The reason I bought it was because it was a few hundred dollars cheaper than any other brands base model foil and it was also a lot lighter, the foil only weighs about 4kgs. It also doesn't look as "beginner" as the other foils so I thought it would last me longer and help me progress. Overall, I feel like this is a good foil to start on, it's forgiving, cheap, looks good and it is probably easy to fix and sand with JB weld. I would like to try it on the north specific foil board to see if it still has the required front foot pressure. Excuse the spelling and grammar mistakes :). A Great honest review calling it as you see it.. I suspect you can't move it back anymore to counter the front foot - or possibly try it on another board with more adjustment.. I have it as back as far as it goes, I might try and make a board and see how I go. The front foot pressure isn't that bad, it's just annoying. Looks like in photos you still have a few cms to move back. Maybe buy two short length boxes say 15cms or 6" epoxy them in a block of high density foam. Trench or rout to insert block with boxes . Then epoxy the block into board contacting the existing deck epoxy layer under. That makes it strong as. Piece of Carbon Matt,few layers of matt. to get the mast back more to relieve front foot pressure. I have corrected foot pressure by adding a shim to the back wing. In my case far to much back foot so a shim (thin ss washer or make from plastic milk bottle) under back screw. In your case shim front screw on back wing. I now foil with perfect equal foot pressure and no sore back leg. Foot stance with back foot over mast is about 500 to 520mm which is comfortable for my leg length. Also smoother ride and less drag was an expexted additional benefit. Thanks for the suggestion, but I think I'll just try and make a new board and sell this one. I can't move it back any further, that's just where you insert the bolts into the rails. I don't suppose you can measure how far forwards/back of the mast position the footstraps are fitted could you? Just interested in whether I'd have the same problems? It looks like the mast is pretty much below your back footstrap. I'll measure it next time I take it out. Sorry, I forgot to measure it! But I've fixed the front foot pressure issue. I added the beginner spacer in it has seemed to fix the issue, I might try moving it a little more forward next time I'm out, it does make it whistle now though. Interesting. According to the North marketing, the spacer is only supposed to slow the pitch reaction (slower to react to front/back foot pressure). Not so worried about the measurements anymore as an Easter deal came up on Shinn foils here so I picked up one of those but might be useful for someone else.